A study from Imperial College London, King’s College London and Oxford University has found that babies with an active male presence in the first few months of their life perform better in cognitive tests at two years of age. Researchers analysed the ways 128 fathers interacted with their babies at three months old and measured the affect this has on an infant’s cognitive development two years later. Cognitive development is the construction of thought processes, including remembering, problem solving and decision-making. The research team filmed the fathers playing with their three-month-old babies without toys, and then again during a book-reading session when their child was two. Fathers were given a score on their interactions and the babies’ cognitive development was measured in tests at age two. Researchers found a positive correlation between how much the men engaged with their babies at three months and how well those children scored in the tests. The results also showed that babies interacting with sensitive, calm and less anxious fathers demonstrated better mental development. At the National Literacy Trust, we deliver several programmes and projects in our Hub areas which are focused on early years development and father-child interaction. Our Early Words Together programme helps parents to support their child’s language. We train early years staff and volunteers to work with parents and children, building fathers’ and mothers’ confidence so that they can support their child’s communication, language and literacy skills from home. In our Bradford Hub, the annual national Men in the Early Years conference is taking place in July to address the gender imbalance in the early years workforce, of which only 2% are men. The conference explores ways to engage more men in the industry and highlights the important role fathers play in the early lives of children. 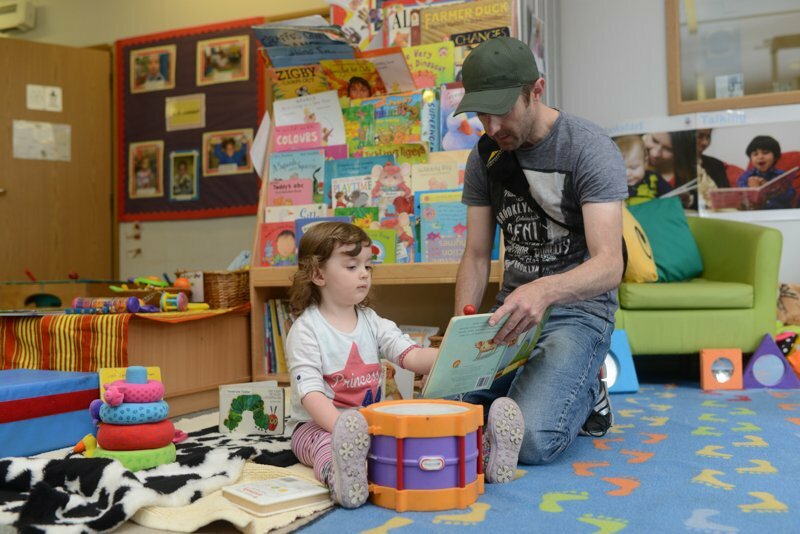 We have also worked with libraries in Bradford to create literacy activities for dads and their children, and celebrated Father’s Day with books and storytelling to encourage them to support their children’s reading and development. As part of the Read Manchester campaign, we’ve encouraged dads to post ‘reading selfies’ using the hashtag #ReadMCR for the chance to win prizes including books and family tickets to watch the Manchester Giants.